Two times in a row, Hungary this winter was hit by a drastic decrease in the gas deliveries from Russia. Both times, the cuts didn’t last long enough to cause real problems. But as the country is the second biggest per capita gas consumer in Europe (only the Dutch use more gas) those events once more emphasized Hungary’s enormous dependence on imported fuel. And as oil prices are also on the rise, the need for alternatives is obvious. Despite that, the development of alternative energy sources only takes off slowly, as do measures to cut down energy use in general. Hungary still battles with a legacy from the communist past, when energy supply was the sole privilege of the state and energy prices, especially residential ones, were way below world level as part of the general social policy. As a result, Hungary’s energy efficiency is half the European Union average, according to recent remarks of Minister of Economy János Kóka. 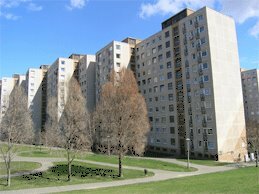 Erzsébet Darvasi is a pensioner who lives in an outskirt of Budapest in one of the innumerable high rise buildings with which the communist government dotted the country in the seventies and eighties to answer the tremendous housing shortages of those days. Like most of these neighborhoods, her 50 square meter apartment has communal heating. The radiators don’t have knobs to turn them on or of. When it is too hot in her apartment, she has to open a window. And it is almost always too hot, even on the coldest winter days, in spite of the fact that the construction of the apartment is so bad, that it is impossible to close the windows completely. Some 16 percent of the countries apartments are heated through communal heating systems. Most of those systems are in desperate need of renovation, although metering, together with the possibility to regulate the heat in apartments, is gaining ground. This is due to the pressure of consumers, who no longer accept rising energy bills without the possibility to regulate their energy use and thus influence their monthly bill. Hungary’s energy savings capacities in the residential sphere are still huge, according to the estimation of the International Energy Agency. Older residential dwellings would profit tremendously from insulation, and even the insulation of new buildings does not always comply with regular EU-energy norms. The problem of course is money. As most houses and apartments are privately owned, people have to pay for those renovations themselves, and although there are some subsidies available, for many people that is just too big an investment. Huge savings also could be made in the public sphere, according to Diana Ürge-Vorsatz from the Department of Environmental Sciences and Policies of the Central-European University in Budapest. Public building like schools, universities and hospitals generally have their own heating system, normally coal or oil based and mostly using totally outdated boilers and heating systems. Local governments also could save much energy, and costs, by modernizing the street lights. According to research from Vorsatz and her colleague Réka Soós, costs more then environment are a reason for Hungarians to think about energy saving. The general awareness about the correlation between energy use and environmental impact is low and there are many misunderstandings. Many people make a connection between carbon emissions and ‘the hole in the ozone layer’ instead of the greenhouse effect. Remarkably, consumers are more aware of the environment then owners of small and medium enterprises, for whom energy in general is just a matter of costs and certainly not an environmental issue on which they would spend extra money. Large enterprises often have a more positive attitude towards the need of energy saving and alternative energy. As Hungary’s big industry was closed down at the beginning of the nineties, most bigger companies nowadays have foreign owners who are used to work according to EU-regulations. Also, most plants are new and therefore built to modern standards, says Vorsatz. Bigger companies may even regard energy policy as a possible public relations factor, like the environmental Grüne Punkt in Germany. Besides, a sound energy policy can be a considerable cost savings factor. In the beginning of March Coca Cola inaugurated a combined heat and power (CHP) power plant at its premises in Dunaharaszti. The gas powered CHP, built by Greenergy in Budapest, produces electricity and uses the extra heat which normally goes to waste for heating (and in Coca Cola’s case also cooling) the factory, thus raising the 35 percent efficiency of a traditional gas power plant to 85-90 percent and thus lowering Coca Cola’s energy bills by 40 percent. Greenergy is a project developer and energy provider, specialized in renewable energy like wind and biomass. The company has built installations for hotels, a plant of Ikea near Sopron as well as the Rózsakert Shopping Centre in Budapest. At Coca Cola, as elsewhere, Greenergy owns the power plants and sells electricity and heat to the customer. One of the projects the company develops is a production unit of biomass energy linked to a CHP. With such a system, a pig breeder could for instance use the manure as an energy source for his operation. But despite the proclaimed readiness of the government to develop alternative energy sources, especially bio mass, Hungarian regulations proof to be a burden in the development of alternative energy, says Erwin van Wessel from Greenergy. “Getting the permissions for an alternative plant like a wind mill or a CHP is very difficult. You have to be able to deliver your surplus production to the national grit, and the Hungarian energy company makes that very difficult. According to them, the grit is not able to deal with such extra peaks, although with small power plants like ours, that produce 7 megawatt, technically there cannot be a real problem”. As a result, Greenergy has some 80 to 85 megawatt in development, for which the company yet has not managed to obtain the necessary permission. On the other hand, companies according to Van Wessel are very interested. “Alternative energy and outsourcing energy production to a third party for them is a whole new concept to which they haven’t paid any attention yet. On the other hand, they see their yearly energy bills going up, so they are becoming more receptive for the idea of alternatives ’’.